Comunicato Stampa: Designed by art historian and curator Adrien Goetz, Crossed gazes in Venice is the third exhibition presented at the Espace Louis Vuitton Venice. After Othello Where Should Go?, Pompey Molmenti&Tony Oursler, and Renaissance, Bill Viola&Carpaccio, this vis-à-vis between the famous Japanese manga artist Jiro Taniguchi (1957-) and Mariano Fortuny (1871-1949), painter, stage designer and photographer, offers two different views of Venice, the other an old contemporary, characterized by incredible similarities. The exhibition Crossed gazes in Venice compares more than 30 designs, created by Jiro Taniguchi for the new Louis Vuitton Travel Book and 25 photographs taken by Mariano Fortuny, preserved in the private collection of the Palazzo Fortuny, as well as his films and his books, thanks to the meticulous restoration work supported by Louis Vuitton, within the framework of the partnership signed with the Civic Museums Foundation of Venice. Both trace the mazes Venetian capturing the apparent immutability of the Serenissima and moving away from its security zone: Fortuny moves away from the painting while Taniguchi from the classic format of the manga. The result is a journey that allows to deepen knowledge and discover unexpected scenarios. 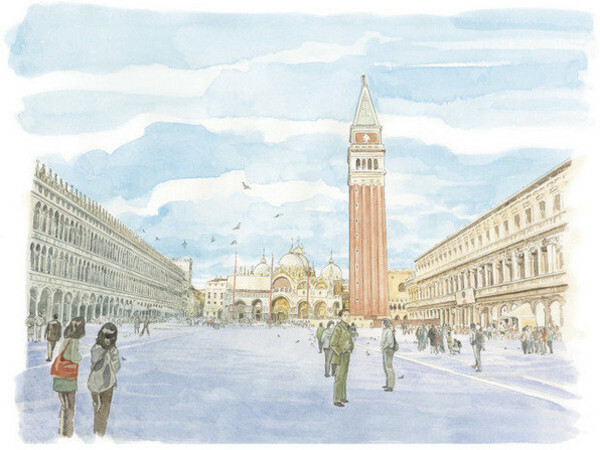 Venice becomes a stage where actors move, Mariano Fortuny and Jiro Taniguchi. In the photographs presented in the exhibition of Fortuny, he immediately recognizes not only his passion for the theater, the set and the set, but also for the unexpected illuminations. In the designer Taniguchi is the comic strip, so close to the manga, but at the same time so different. Among the thousands of photographs from the vast archive Fortuny - Venice alone there are more than 1,500 - has selected a set of extraordinary images that portray the city from unusual perspectives and at the same time immortalize the gestures of everyday life. Taniguchi, in turn, uses photography in two ways: as a tool to fix the emotions which then develop the story in the silence of his studio and as a key narrative of the voyage in which some of Cayer yellowed photographs, carefully preserved in a box lacquer, are memories of a family trip in the lagoon city that start the journey of the protagonist of the story.